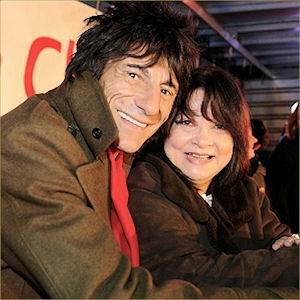 Rolling Stones guitarist Ronnie Wood joined thousands of villagers in Claygate at the annual Christmas lights switch-on. The rock star, who lived at Ruxley Towers, delighted organisers by agreeing to take part in the ceremony only last week. 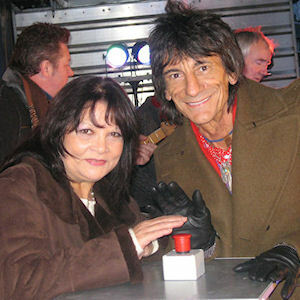 He was joined by Françoise Pascal, star of the 1970s TV show 'Mind your Language', to press the button and turn on the lights on Saturday, December 4, 2010. 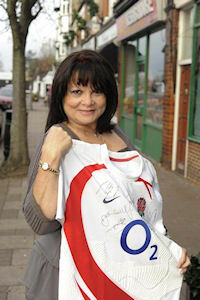 Claygate councillor Steve Wells also auctioned a rugby shirtsigned by the English Team and donated by England team manager Martin Johnson. Seen below. It sold for £260 and was bought by Neil Strachan, who is currently serving in the Grenadier Guards. The proceeds were donated to Help for Heroes.